I didn't attend the function after what happened at the last executive meeting. Yes, I was the first to complain about the incidents at the last executive meetings as they were completely out of character of the party of the past. However, it is evident that things have changed under the new regime. 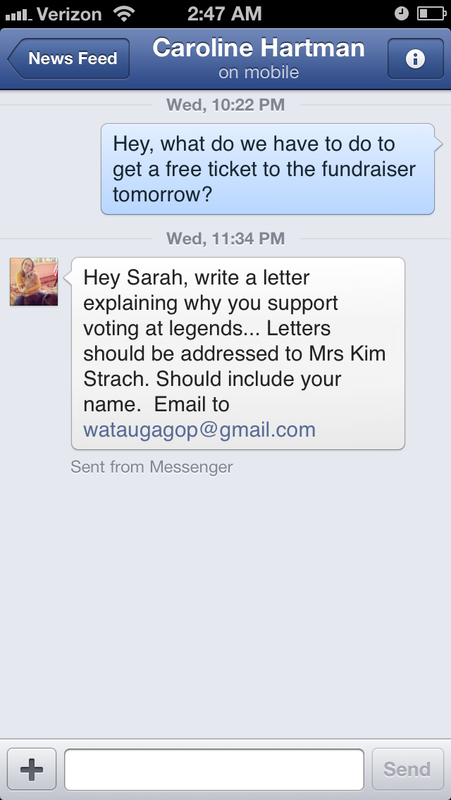 I wrote a letter in support of Legends before they even chose Legends. Nobody offered me a free ticket much less an invitation. Thanks for providing the link to HC News. I found that very interesting. This moderate Republican who has as many (or more) Democrat close friends would love to see Ms. Yates out of that role. There is no doubt in my mind that Ms. Yates is a the root of the Board of Election issues. If I were to run for office, I could not see her supporting me because I would tend to vote across party lines, seeing the whole picture. Your "snitch" is a very poor relayer of the facts because the ultimate intent is to distort the truth. Nathan Miller said no such thing about Britt Springer. He neither mentioned her by name or referred to her. You are all too anxious to diss Nathan Miller that the facts are an inconvenient truth. As for Anne Marie Yates not allowing Springer to speak, that is completely incorrect. There was a candidate sign-in sheet at the check-in table and Springer failed to sign-in as a candidate thus no one knew who she was. It was an honest mistake. I suppose you feel that the only way to "convince or sway" people to your side is to lie and misrepresent the facts. In your eyes the truth will get your nowhere. Ummm, Anon 4:36, the blogpost doesn't say anything about Nathan Miller saying anything about Springer. It says he 'dissed the D.A. 's OFFICE'. This is called a paper tiger, I believe. You state something incorrectly, and then attack it as untrue. Hmmmmm. Please tell your snitch that we Republicans are thankful for his $25.00 contribution to our cause. We will use it to defeat your candidates again in 2014. Which political activist a few years ago remarked "I wish the County would buy up every available tract of land in the county."? Of course, this statement was made when the Democrat Party was in control of the BOC. Now that the Repubs have control, I guess it's politically correct to oppose such purchases. Huh? Yes, people who go to open meetings and comment on what they observe are "snitches".